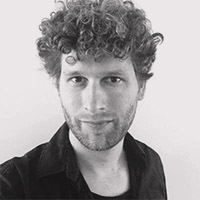 I'm a multimedia designer from Rotterdam, NL and graduated from the AKI, Academy of Fine Arts Enschede with a bachelor degree in Visual Communication. I effortlessly switch between working on a signage and icon systems one day, responsive web design with a focus on typography and editorial design the other, closing off the week capturing scenes of an architectural model with my full-featured 4K video setup and a 3-point lighting system. All driven by an extensive dialogue between client and designer and an inexhaustible curiosity for the discovery of new possibilities in the task at hand. I work with, and worked for, amongst others, ZUS [Zones Urbaines Sensibles] Architects, Artist Melle Smets (Department of Search), Bureau B+B Landscape Architecture, Musician Joris Voorn, Villa Zebra Art Museum for children, Exhibition designers Koehorst in 't Veld and Ydoc Foundation, Platform for Visual Storytelling.